Lincoln, CA (October 25, 2016) – Blair Hinkle outlasted a star-studded field in the $2500 Heartland Poker Tour (HPT) Championship Event at Thunder Valley Casino Resort to capture his first HPT title and $223,411. The Kansas City, Missouri poker player began the Final Table in eighth place, but by the end he had collected all of the chips at the table. “It’s been a long one. It’s been a grind for sure,” said the new champ with a smile on his face after the win. After a marathon Final Table, the last hand saw Hinkle and opponent John Sheehan all-in before the flop with Hinkle holding eight-seven to Sheehan’s ace-ten. Hinkle had the Novato, California resident covered. A seven on the flop gave him the lead and another seven on the turn all but sealed the deal. Sheehan was drawing to a gutshot straight on the river, but it didn’t hit and he was eliminated as the runner-up for $137,931. The event at Thunder Valley drew 437 total entries, nearly doubling the $500k guarantee. The $974k prize pool was one of the largest in HPT history. JC Tran, Mark Newhouse, and Tyler Patterson were among the notables to enter the $2500 tournament, while HPT commentators Jaymz Larson and Kenna James provided commentary of the Final Table to hundreds of viewers on the live stream from beginning to end. Derrick Geliberte had the chip lead at the start of the day. The business analyst from Elk Grove, California also had a career earnings total of zero dollars. Even more impressive, Geliberte won his way into the $2500 event through a $350 qualifier. In the end, Geliberte fell short of the title but he still managed to take home $91,792 for third place. 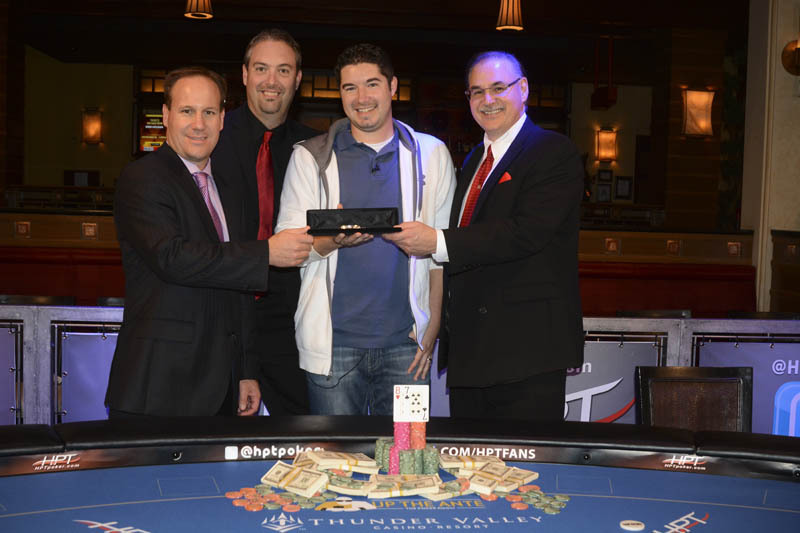 The championship event was Saurabh Patel’s first time playing an HPT event. The software engineer was knocked out in fourth place when his king-nine failed to outdraw Hinkle’s ace-jack. Patel, from San Jose, won $63,623 for fourth place. Poker player Daniel Maor was playing under the lights at an HPT Final Table for the first time Tuesday. The San Jose native made the best of the opportunity, laddering up to a fifth-place finish. Maor earned $48,082 for his weekend’s worth of work. Like Geliberte, Lance Donnell won his way in on a $350 satellite. Donnell played his way to the nationally televised Final Table for a five-figure score. The Reno man collected $37,397 for sixth place. Marty Verdegaal was in good shape to double up when he got the last of his chips into the middle with pocket kings against Geliberte’s ace-queen. Unfortunately for Verdegaal, an ace hit the river and his run at the title was over. The Hanford, California business owner’s seventh-place finish was good for $31,083. Fresno’s Hou Vang exited in similar fashion when his pocket eights lost to Hinkle’s nine-seven. Vang was sent to the rail in eighth place with $25,741. Business owner Ian Kalman became the first player to hit the rail Tuesday evening when his pocket queens lost to Sheehan’s aces. The San Francisco man took home $21,758 for ninth place. From here, HPT will head back to the Midwest to finish out the calendar year with tour stops in St. Louis, Kansas City, and Southern Indiana. 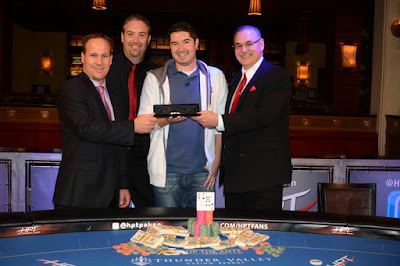 For a full list of upcoming events, visit HPTpoker.com.